For other ships with the same name, see HMAS Encounter and HMAS Torrens. HMAS Encounter is a former Royal Australian Navy (RAN) depot located in Birkenhead, South Australia, Australia, in operation between 1965 and 1994. Formerly HMAS Torrens commissioned in August 1940 before being commissioned as HMAS Encounter in 1965. 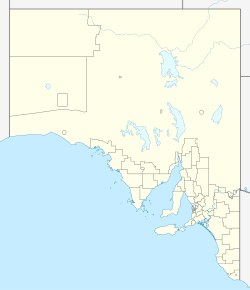 With the base closure in June 1994, a Navy Support Office South Australia was established in Keswick Barracks. ^ "HMAS Encounter – Decommissioning at Port Adelaide". Naval Historical Review. Naval Historical Society of Australia. June 1994. Retrieved 11 August 2017. This page was last edited on 18 December 2017, at 20:10 (UTC).